nards stomped on by a horse on crack. Best release since their debut. Although some of the songs "feel common", there's a self-awareness here that helps the band formulate their own rules within their sound - boundless as it might seem. It's terrific to hear some extra instrumentation on this thing as well. 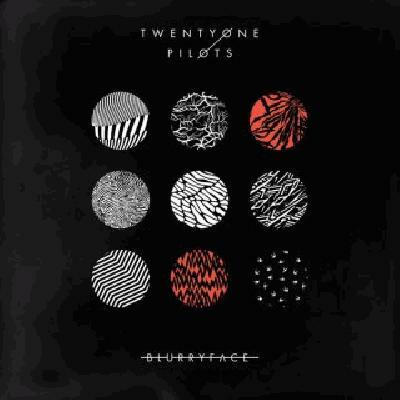 Blurryface is a surprisingly cohesive and emotional piece. It defies the constraints of any single genre - and even though it definitely falls short of mastering anything, it's constantly on the heels of discovery. At the very least, that makes Blurryface an intriguing journey. The best moments come when Twenty One Pilots let loose and show their vulnerable side; "Stressed Out" and "Goner" mark two of the most self aware and heartfelt tracks the duo has ever crafted. Oh boy, a relevant album to review. I want to start this review by saying I believe creating catchy songs is more of an art than some classic rock "purists" would have you believe. Artists like Taylor Swift, Paramore, and yes, twenty one pilots have managed to do this while still maintaining a semblance of great artistry with their lyrics and melodies. With their sophomore major-label album, Blurryface, twenty one pilots took this to the next level, combining some of the catchiest genres ever, (ska, electropop, and others) to create a new-sounding yet very familiar feel. To use an example, the song "Ride" draws heavily from the reggae and ska genres, with syncopated and bouncy piano chords, and sing-along Whoa-oh-oh-oh refrains, but also blends in some banging dance riffs, and Gorillaz-sounding verses. "We Don't Believe What's On TV" brings the ukulele back, creating a very poppy sound, but with the picked root note bass and anti-media lyrics, also presents itself as punk. For the most part, all this is executed well, from ska to 90's hip hop to rock to electronica, creating an unbelievably fun album, but there are a couple problems. To start, the lyrical themes on this albums prove inconsistent at times, which makes it feel more like a compilation and less seamless. My main problem, however, comes from what is also the best part: the instrumentation and production. Every genre brought into this album only feels new and exciting for one or two songs, then feels formulated. Because of this, a good number of songs on the second half of this album feel less exciting then what was intended. Songs like "Doubt" and "Message Man" exemplify this with their overuse of dubstep concepts. This album would be best delivered with 8-10 songs, not 14. I felt like there was a reversion to Calvin Harris-like beats on songs like "Hometown", and this album should deliver new pop. I can't keep from smiling, however, at least on the first half. Really, the best thing would be to get rid of "Doubt", "Message Man", "Hometown", and "Not Today", and this album could be a 4.5, but as it is, not quite. who: twenty one pilots has decided to manifest itself as two guys. / / / / / / / / / / / what: twenty one pilots is a band that does not want to be heard; they want to be listened to./ / / / / / / / / / / / why: basically,we are all responsible for the preservation of our personal joy; but happiness is different. joy is notcircumstantial,happiness is.you can be depressed andstill have joy. you can be suicidal and still have joy. we all stop thinkingand we all stoptalking and we all stop sharingand we all stop creating, because bydoing any of these things we quickly find outjust how unhappywe are. but that's ok. that's normal. don't letthe fear of unhappiness cripple your pursuitof finding what it isyou believe. since joy isfound in belief, we all have to push through unhappinessto find joy.basically. / / / / / / / / / / / / how: recording songs at our house and giving everything we have at shows. we are not good enough at our instruments tostandup there andhave you watch.since we will ask you to be involved at these shows, we will work to gain your respect andtrustfor the first half of the set; thesecond half is governed bythe whole room. Recognising that a music piece is bad at a first listen is actually pretty easy. A centrifuge of all the poppiest trends out there, a singer that is Mika on one song, a bad white rapper on another, while sometimes remembering that he once was a pop-punk listener or something. I don't know man, I don't know. Substance in music is everything and this disc holds none. I can't hear you over how much I apparently don't care. Emotional masterpiece? Um, NO. Jesus, is this disappointing. Music for high school students that think they're lol xd random and different. There are a lot of other problems with this album, like the pretentious writing or Tyler Joseph's bad vocals, but what hurts even the good songs is producer Ricky Reed (who I don't know why is still working in the industry after making so many garbage songs like "Wiggle" and "Me Too". )rThe album has a lot of disadvantages: annoyingness and overproduction ("Heavydirtysoul"), pretentiousness and obnoxiousness (Fairly Local), filler ("Message Man"), mediocrity ("Lane Boy"), stuttered hooks ("Doubt"), Ukulele ballads ("The Judge"), and straight up garbage ("Ride").rBut there are some redeeming factors: "Stressed Out" is a pretty relatable piece about growing up and contemplating on your youth, "Polarize" is a pretty catchy song, "We Don't Believe What's on T.V." is also fun, "Goner" is a nice piano ballad that ends pretty bombastically, "Hometown" is a very beautiful sounding electronically hinged track, and then there are the albums two centerpieces, "Not Today" and "Tear in My Heart", both of which show how good twenty one pilots can actually be at crafting hooks and melodies. rIf only the rest of the album was as good. My name is Angel and I honestly don't care what you think, Blurryface. Tyler Joseph and Josh Dun, the people who comprise the Schizoid pop duo called Twenty One Pilots, have dished out an overall passable LP that could've been much more if it weren't for the excessive amount of filler and inconsistency. Blurryface has a solid first half whilst also possessing a comparatively lackluster second batch of songs, and the authenticity of the general concept here is pretty worthless. This record has its share of enjoyable tracks (e.g. "Heavydirtysoul," "Stressed Out," and "Goner") and downright avoidable numbers ("Fairly Local," "Doubt," and "Message Man" are especially heinous). Bystanders will certainly be in for quite a chore. Uninspired, boring, and lengthy pop, rap, or whatever genre twenty one pilots was doing at the time. Drawn out, bland, and boring songs throughout, one chord choruses with basic 4/4 beats gets incredibly boring after so long. Y'all know this is gonna be the most classic release of our time, c'mon. An album that blends together different genres and musical elements that sounds like it wouldn't work on paper. People love it, and others hate it; I fall closer to the former party. This was a surprise for me with how much I found myself enjoying the album. While it's not as "deep" as some may portray it is an interesting look and listen into the psyche with stress, fears, and doubts. Blurryface isn't as strong as the duo's previous album, but there are some great songs and moments among some filler which aren't particularly bad, just not as good. Overall an album filled with interesting blends of instrumentation, a great vocal performance by Tyler Joseph, and enough melodic hooks that will stick with you whether you like it or not. An album that defies one specific genre classification with a good number of verses rapped and poppy choruses .Lyrically it is quite interesting too because it seems that somebody poured their soul into it and also made it very self aware, which is somewhat entertaining. I wasn't expecting this to be so good. It has all the energy that an alternative pop album should have. My name is Blurryface and I care what you think. There is SO much emotion behind these two. I saw them live, and it was incredible to see only two people make a stadium of 10,000 go freaking nuts. Cannot wait for the rest of this album to be released.